The following is a paper given by the doctor of theology Jean-Claude Larchet (France) at the international conference, “Rus’—Holy Mount Athos: A thousand years of spiritual and cultural unity,” as part of the 1000-year anniversary celebration of Russian monasticism on Mount Athos (Moscow, September 21-24, 2016). It was published first in Russian translation on the website of the Synodal department for monasteries and monasticism of the Russian Orthodox Church. Monasticism is basically a way to live the Christian life with a total commitment to renouncing the world and self-dedication to God. From this point of view, monasticism is the same everywhere, and each monastery, skete or hermitage is a privileged place, a center of reference for the monastic life and for Christian way of life. To a great extent, what can be said of monasticism can be said of Mount Athos, and what can be said of Mount Athos can be said of monasticism. Yet Mount Athos has long been a fascinating place, which attracts the attention not only of Orthodox, but people belonging to other religions and even of non-believers. Evidenced by the large number of books and articles on the Mount Athos, as well as by the incessant flow of pilgrims and visitors from around the world. This fascination is not new, but it is surely greater in our time than in the past. There are several reasons for this. 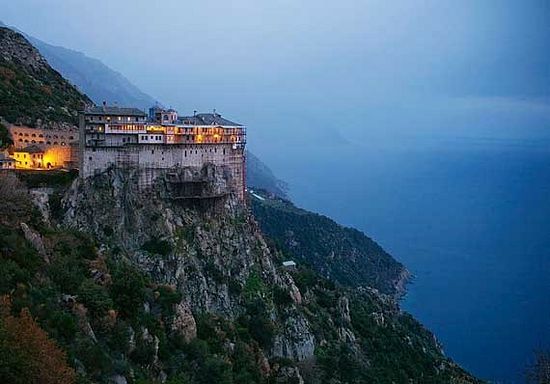 1) The first reason is that Mount Athos is an autonomous republic—and for this like a country—inhabited only by monks and completely dedicated to monastic life. Although every Orthodox country has at least one region that includes several monasteries, there is no other country that brings together such a large number of monasteries, sketes and hermitages, and is an area ruled by monks, with a real border that delimits it in relation to surrounding countries or regions. It is a protected area not only politically, administratively and geographically (being a peninsula), but also spiritually, as Mount Athos is commonly called “The Garden of the Mother of God” and considered a place that belongs to her and where she is particularly present. In that it is a country entirely populated by monks, it does not allow the “free movement of persons” required by European laws, does not accept the influx of tourists, nor does it accept the entry of women, but extends the monastic enclosure to the extent of its physical, geographical boundaries. Mount Athos is a land like no other. 2) Secondly, Mount Athos is a witness to the Kingdom of God already present among us. Mount Athos is a place that houses the most numerous and important relics of the Orthodox world. These relics make present, and active by their miracles, almost all major Christian saints. Mount Athos, as a concentrated locus of monastic life and a place particularly favourable to sanctification, itself has produced thousands of saints, known and unknown. Some in our time have a global reach, such as St. Silouan, Joseph the Hesychast and his spiritual sons, or St. Paisios. Through its numerous saints of the past and present, Mount Athos appears, in the words of the Psalmist, as “the fertile mountain”, “the fruitful mountain”, “the mountain where it pleased the Lord to live” and where He “will live forever” (Ps 67: 16-17). 3) Thirdly, Mount Athos is a reminder and an announcement of Paradise. It is not only through its saints, but as a blessed place, a sacred institution that Mount Athos prophetically manifests another world that gives meaning to the present one. Mount Athos, also called the “Holy Mountain” or “Virgin’s Garden” is an image of Paradise, a reminder of Paradise lost by our first parents, and a symbolic prefiguration of the Paradise promised to the righteous. a) Mount Athos offers the image of a paradisal nature because in the variety of landscapes that range from sea level up to two thousand meters, where the summit of Athos reaches its peak, many plant and animal species live and are a microcosm summarizing the world. Another reason is that nature remains untouched, protected from economic exploitation and industrial pollution. Its very existence in the modern world has an exemplary value. It is a model of spiritual ecology; it demonstrates the integrity of creation entrusted originally by God to man for his use and needs, while making a means of contemplation and thanksgiving. b) The space of Mount Athos reflects the heavenly space too, and foreshadows the space of the Kingdom of Heaven. Unlike the space of all countries in the world (divided between sacred and profane, sometimes even entirely profane), the Mount Athos area appears totally sacred, not only by the presence of a large number of monasteries, sketes, hermitages, churches and chapels, but also because it is entirely sanctified by the saints who went all over, have filled it with the voice of their prayer and diffused everywhere the divine energy they radiated. Every time we walk on a trail of Mount Athos, we are sure to put our feet in the footsteps of saints who have preceded us. Many places in nature retain the memory of apparitions of Christ, of the Mother of God or of saints. There is no monastery here, or hermitage, or chapel, or source or fountain whose presence cannot be explained by a heavenly vision or a miracle. c) One must say a few words also on the prophetic significance of Athonite time. One of the things that has the greatest material impact on visitors to Mount Athos, and which to some extent disorients them, is the change of time. Most monasteries keep the Byzantine time, which no longer serves as a reference to any nother part of the world. Our time, the monks call “kosmiki ora”: the hour of the world. Byzantine time is not a mere relic of ancient times; it shows another modality of the time, a spiritual time, sanctified because it is entirely devoted to God, divided and organized to respond to His will. Symbolically it reminds one of the heavenly time and announces the time of the Kingdom. 4) A fourth important point is that collective life as organized across Mount Athos and in each monastery is a call for unity of all men, and a testimony that such unity is possible in Christ. In a world torn by wars, nationalism, ethnic conflict, racism, this testimony and this appeal are truly prophetic. Mount Athos as a whole testifies for many centuries to the good relations of communities of different ethnic backgrounds who not only peacefully coexist, but live harmoniously in the bond of charity. It is in this bond of charity that the Holy Community, consisting of representatives of the main monasteries, rules the Mount Athos not according to worldly democratic principles but in the spirit of Christian conciliarity (соборность). Each Athonite monastery provides a similar testimony, led by a council of elders that is headed by a hegoumen (abbot) elected by the monks. 5) As a fifth point, one must mention one of the fundamental roles played by Mount Athos in the history of Orthodoxy, which is today perhaps more than ever of paramount importance: that of maintaining Tradition and defending the Orthodox faith. This is still a prophetic role, because traditionally the prophet is someone who reminds people of their fidelity to God, and is a defender of the faith in the face anything that seeks to alter or pervert it. In a world subject to increasingly faster change, Mount Athos gives the example of stability and permanence in the image of the divine world. Preserved from the thirst for change and the dizzying movement that occupies men living in the world, protected from the sociological pressure forcing compliance in all respects to the lifestyle of modern societies, the Athonite monks scrupulously conserve canonical prescriptions, liturgical practices and ascetic lifestyle that our Fathers have passed down from generation to generation. The very scrupulous maintenance of the tiniest traditions was the condition for more than a millennium of perfect preservation of Orthodox Tradition. The Athonite monks also contributed greatly to preserve the Orthodox faith in all difficult moments in history when it was threatened, and they still do so today. And for this they receive a special prestige and a great authority. The prophetic role of look-out and lighthouse that Mount Athos traditionally plays in the Orthodox world for reporting deviations from the Tradition and to remind the people of what is the true faith, is particularly significant in our time, when we can observe a considerable weakening of dogmatic consciousness. 6) A sixth and last point is that Mount Athos also contributes in a fundamental way, to maintaining Orthodox spirituality in an unchanged and vibrant state. This spirituality was elaborated by the monks of Palestine, Syria, the Sinai and the Studion of Constantinople, but the Athonite Fathers became, from the thirteenth century, its main heirs and depositories. Mount Athos has become a gold standard of asceticism and spirituality, and attracted many monks of all countries. When visiting or returning to their country of origin, these monks have contributed greatly to the spread of this spirituality. In particular, Mount Athos has always been a center for the practice of the Jesus prayer and hesychast spirituality. And it is always in Mount Athos that this practice has, so to speak, its center. The Athonite Fathers have the task of communicating to people today this ancient heritage and a responsibility to pass it on to future generations. In this also lies the prophetic and eschatological role of Athonite monasticism.